On the second of July 1914, twenty-six days before the outbreak of the First World War, Joseph Chamberlain passed away. What this meant for Britain is fairly well documented, and his legacy preserved mostly in the political career of his son Neville. Closer to home, however, the death of Chamberlain marked the death of the University of Birmingham’s first Chancellor, and of one of its founding fathers. His importance to the University had already been well-acknowledged – Old Joe, perhaps his most iconic legacy, had been built some six years prior to his passing. As the world passed into the most seismic human event in its history, the University of Birmingham entered a period of uncertainty, with nobody succeeding Chamberlain as Chancellor until after peace had been declared four years later. In Chamberlain’s absence, the University campus was in part requisitioned by the War Office as a facility for research and medical aid. Britain declared war on Germany on the fourth of August; by the fifth, the Royal Army Medical Corps had begun to deliver beds and mattresses to the University. The ornate Aston Webb building was transformed into the 1st Southern General Hospital and immediately became the city’s only war hospital, treating wounded servicemen from all across the globe. The first of these men arrived at the start of September, and by New Year’s Eve the hospital would have treated nearly four thousand patients. Nurses were drafted in from all across the West Midlands, with the majority of nursing staff being recruits from the University’s own medical faculty. In addition to this, members of the Territorial Force Nursing Society and the Women’s Voluntary Aid Detachment were called upon. 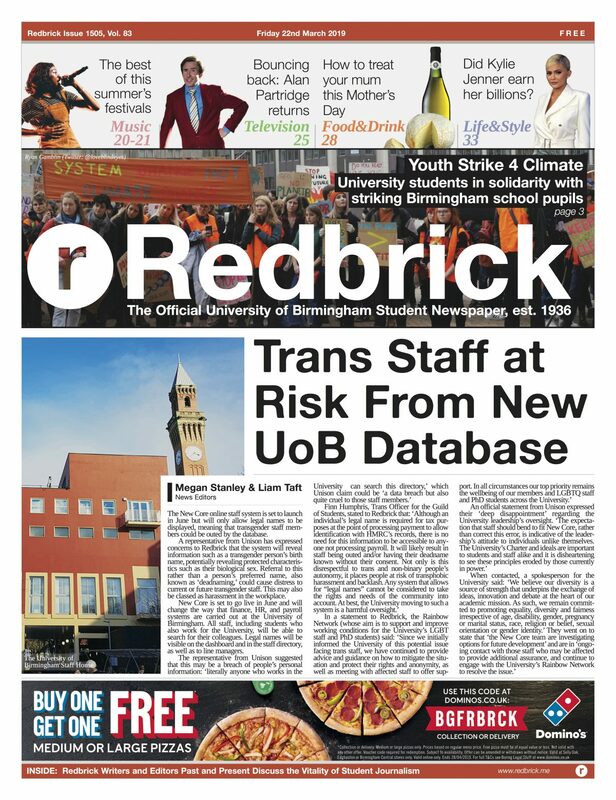 Naturally, the arrival of so many more (mostly) female bodies on campus came with a new dilemma, and accommodating these new arrivals led to a huge shift in the way the University was run. A still from the photograph album of Eveline Wauchope (front right), taken from the steps of the University House hostel. The other three women are identified (from left to right) as ‘Staff nurse Shaw’, ‘N. Goss’ and ‘N. Rice’. Image courtesy of the Cadbury Research Library. University House (now defunct, but at the time used as accommodation for UoB’s female undergraduates) was repurposed for the sake of housing many of the nursing sisters. 126 medical professionals stayed here during the war, with many doubling up on rooms in order to fit everybody in. One of these new tenants was Eveline Wauchope, a young nurse from County Armagh in Ireland. The youngest of six children and born to the Master of a Workhouse in 1891, Wauchope was schooled in Belfast before emigrating to Birmingham to study and work at its General Hospital in 1912. Two years later, at the age of 23, she would move to Edgbaston to join the staff of the 1st Southern. 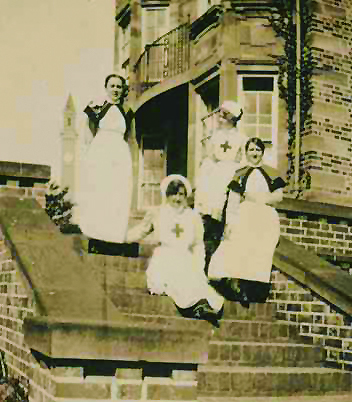 The majority of photographs across this spread are taken from Wauchope’s personal photograph album, kept throughout the war and used extensively by the nurse to document her time working on campus. Nowadays this album, alongside an autograph book also kept during the war, is in the possession of Eveline’s family – although electronic copies are held by the University’s Cadbury Research Library, located 100 years later underneath Muirhead Tower. Professor Muirhead, for whom this tower is named, was one of the few lecturers left on campus during the First World War, with many of the University’s male faculty conscripted into forms of military service. One lecturer, Dr Ottoker Intze, had been recruited into the German forces during a holiday in his homeland in 1914. Three of his students had been visiting Germany alongside Dr Intze, and all were forced to spend the duration of the war in the Civilian Rhuleben Camp near Berlin. A depleted male faculty bled into the undergraduate ranks, which were purged of the vast majority of its male members as a result of the war effort. This meant that, even in a time of relative gender bias amongst higher education institutions, the majority of students at UoB during the war were women. Those female students who now comprised most of the University’s student populace were quick to deliver upon the responsibility they now shouldered. Many, as previously documented, entered into volunteer schemes such as the Women’s Land Army, and the then-named Guild of Undergraduates enjoyed four years under the unprecedented stewardship of a majority-female student council. Despite this, there was debate on a national scale as to whether the education of Britain’s female students should take precedence over their potential for helping the war effort if conscripted into the relevant services. Sir Oliver Lodge, who had taken de facto control of the University in the interim period following Chamberlain’s death, spoke publicly about plans to build a women’s refectory on campus, and provide extra lessons in ancient history for his remaining students during the war. In reality, the University and Lodge would spend most of its time and resources on chemical research and the development of munitions, with what were then seen as traditionally ‘feminine’ subjects suffering from a loss of funding to accommodate the scientific endeavours taking place on campus. Female students had been granted the right to remain on campus, but were still making ends meet at a temporary accommodation site while University House was being occupied by the nurses of the 1st. The place in question, a house in Edgbaston named ‘Wyddington’ that had been supplied free of charge to the University, had space for just 32 of the students and staff members that had previously inhabited University House – around a quarter of the room formerly available. Ms Orange, as Warden of the Women’s Hostel, was responsible both for maintaining this new secondary residence at Wyddington and for arranging the renting arrangement between the University and the War Office for the occupation of University House. A tough and thankless ask, Orange’s papers from the period show her struggles to sustain these arrangements, from miscommunications over rent rates to worries over the fire insurance on both residences. Following the war, the Warden attempted to file a claim for compensation from the War Office for the disruption caused to the University’s accommodation policies – these claims were, however, denied in 1921. During the Great War, an estimated 176 of the University of Birmingham’s academics and alumni were killed in action. Of this number, there was just one female casualty: a graduate, Dr Elizabeth Stephens Impey, who had studied at the University a few years before joining the Other Empire Force on 10th December 1915, as a medical officer. Twenty days into her service, while sailing onboard the SS Persia to join the Dufferin Hospital for Women in Lahore, India, she perished as the boat was torpedoed in the Mediterranean. In 1907, while a student at Birmingham, Impey had become the first woman to be elected President of the Guild of Undergraduates. The hospital remained busy until April 1919, a full five months after peace had been declared. Four years before this, in June 1915, the 1st Southern General received a private visit from King George V. This was a secretive affair, with no publicity and only a small number of representatives chosen to receive the King. Kathleeen Grace Lloyd (1877-1976), Matron at the 1st Southern General Hospital. Image courtesy of the Cadbury Research Library. 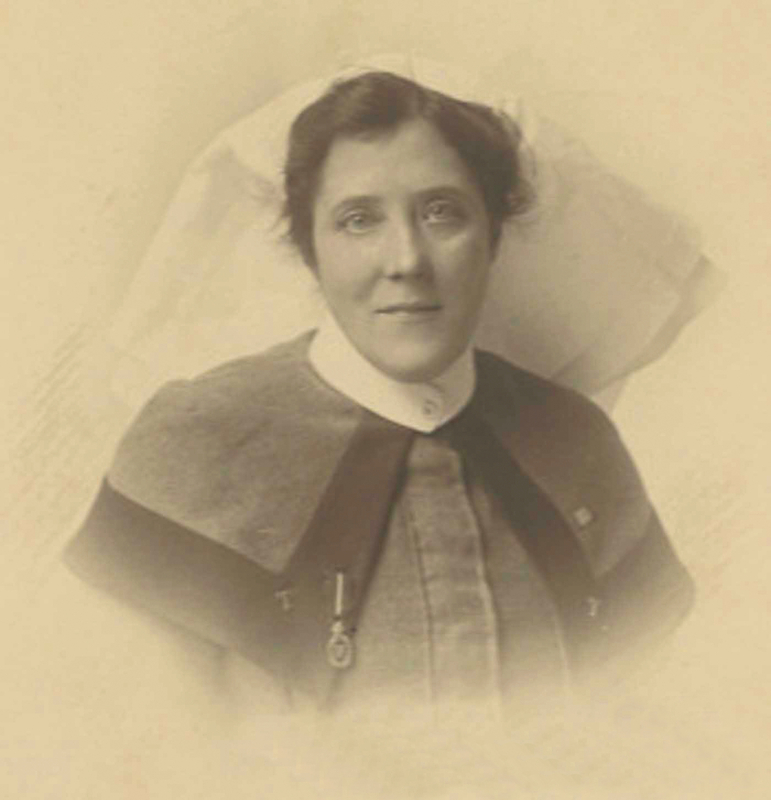 Amongst these few was Kathleen Grace Lloyd, Matron of the hospital and a highly respected leader amongst the nurses. Born in the same year as Dr Impey, Lloyd had trained at Birmingham General Hospital (where Eveline Wauchope would study a few years later) from 1904-08, nursing there before moving to Edgbaston for the war effort. Wauchope, like the other nurses, would refer to their superior simply as ‘Matron Lloyd’, a token of the professional esteem in which they held the leader. For her work at the 1st Southern, Matron Lloyd was presented with two major honours in the years following. The first, and perhaps most prestigious, was the Royal Red Cross, a medal awarded for exceptional services in military nursing that had first been received by Florence Nightingale. In 1920 Lloyd was also recognised with a Queen Elisabeth Medal courtesy of the Belgian royalty, for her medical care of Belgian victims of the war (a number of refugees from here and from Serbia were granted free study at the University from 1914 onwards, which may account for this). The Matron would go on to become a member of the Women’s Voluntary Services during the Second World War, before her death in 1976. In the hospital’s magazine, Southern Cross, one nurse described the converted Aston Webb hall as ‘the palace at Sinaia, the King of Roumania’s summer residence in the Carpathian Mountains.’ Perhaps a slightly overwrought interpretation, but by its closure in 1919 this ‘palace’ had been the life of hundreds of staff and thousands of soldiers. The 1st Southern General Hospital treated more than 125,000 cases over four years of war. At one point canopies had to be erected in University Square to accommodate the surplus beds, and many satellite hospital wards were launched in the surrounding areas of Moseley and Northfield. 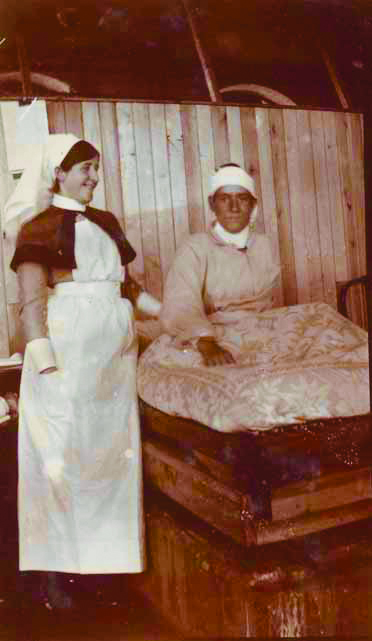 Nurse Wauchope (left) with a patient of Ward A2, Private ‘Billie’ Jones. Image courtesy of the Cadbury Research Library. Wounded soldiers would attend workshops to mend supplies for both the hospital and the front line. Classes were also given in subjects such as gardening, carpentry and languages, with many drama companies and Birmingham theatres providing free entertainment for the servicemen and nurses. Many would paint (Cecil Price, one of these painters, is the creator of the painting at the top of this article); Nurse Wauchope would walk around the wards with her autograph book allowing soldiers under her care to sketch and write inside its pages. A century later, this book remains as a remarkable artefact of life inside the 1st Southern General. This article was made possible through information collected from the Cadbury Research Library and Birmingham City Council. Artefacts and photographs from the period can be found at the Cadbury's on-campus location. For more details on UoB during World War I, Peter Vessey's three-part series is available here.